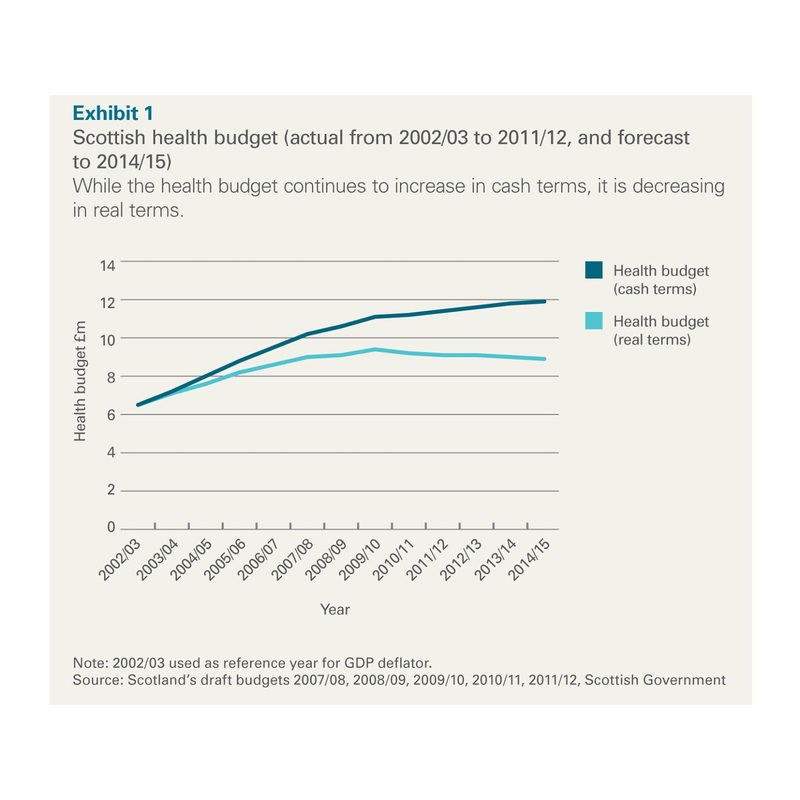 Audit Scotland has published NHS financial performance 2011/12, an overview of the financial performance of the NHS in Scotland in the last financial year. It shows a picture of increasing financial pressure on health boards as the real term cuts bite. 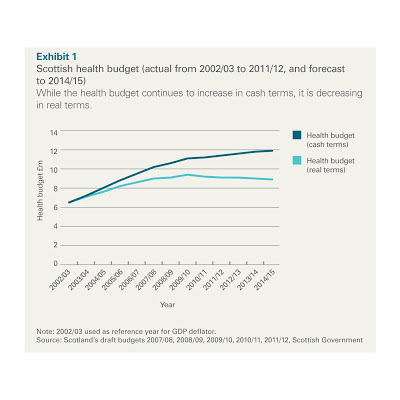 Although the overall health budget has continued to increase in cash terms, it has been decreasing in real terms since 2009/10 and is projected to decrease further in real terms for the next three years. The NHS continues to face significant pressures that will make it difficult to reduce costs while maintaining high-quality services. Demand for services continues to grow, particularly due to an ageing population; it is becoming more difficult to identify recurring savings as early opportunities have already been targeted. Building maintenance (£1bn backlog) and rising drug costs (+3.2%) are highlighted in the report. Spending on heating and lighting increased by 5.8 per cent on the previous year. Three of the 14 territorial boards (Fife, Forth Valley and Orkney) would not have broken even without additional financial support from the government. As the three boards are using £6.2 million of capital to repay their revenue brokerage, these funds will not be available to the overall NHS capital budget. There is also a risk that the investment needed to maintain and develop the clinical estate, equipment and ICT will be unaffordable. Nine territorial boards reported an underlying recurring deficit in 2011/12. Around 20 per cent of savings (£67 million) were non-recurring in 2011/12. This means that boards need to make further savings of £67 million immediately in 2012/13 just to be level with the 2011/12 position. These £67 million savings are included in the 2012/13 savings target of £272 million. Each year, it becomes more difficult for boards to find recurring savings. Eight boards have categorised at least a quarter of their savings plans as high risk, with NHS Lothian stating that two-thirds of its savings plans are high risk. Overall, 20 per cent of the savings target is classified as high risk, raising concern about the achievability of the savings plans and boards’ ability to break even in 2012/13. The NHS in Scotland employed 131,172 people (135,823 at 30 September 2009). Further reductions in staff numbers are expected reducing to 130,370 by March 2013. This represents a cumulative reduction of four per cent since 30 September 2009. While there have been increases in medical and dental staff over this period, nursing and midwifery numbers are forecast to reduce by four per cent. The largest decrease will be in administrative staff (8.1 per cent). In 2011/12, total spending on PFI charges was £184.5 million (£154.1 million in 2010/11). This was due primarily to increases in charges of £15.7 million in NHS Forth Valley and £8.1 million at NHS Fife, as a result of the completion of the new PFI projects at the Forth Valley Royal Hospital in Larbert and Victoria Hospital in Kirkcaldy. PFI charges are a significant financial commitment for boards.